Organised by UK Nepal Friendship Society Board Member and Coordinator in Nepal Ganesh Panday, UKNFS CEO Alan Mercel-Sanca accompanied by organisation strategic advisor, Dr Davies, the renowned British painter and UKNFS Visual Arts Ambassador Stephen King, along with British entrepreneur and businesses international online marketing specialist, Mr Paul Nash, completed on 25th January a ground-breaking visit to Nepal, in conjunction with and supported by UK Nepali community organisation leads. The delegation visit took place at the timing of the formal opening of a school in Sindhupalchok, much of which had been enabled through extensive fundraising by UKNFS partnering organisation Sahara UK, whose President, Min Bahadur Gurung (who lead the ceremonies of formal inauguration), is also a UKNFS Board Member. The extensive programme of key meetings with nationally and internationally renowned lead figures across different business sectors, banking (NBA, Mega Bank, Civil Bank, etc. ), national agencies (NEA Managing Director, etc.) also included some meetings with highest level political leaders & senior ministers designate, and an audience with former Prime Minister, Mr Jhala Nath Khanal, shortly be the next President of Nepal. 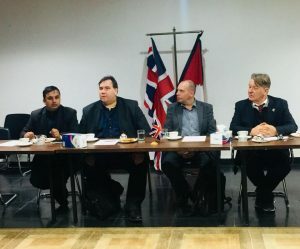 The resonance of analysis of need, and solutions, opportunities and strategy that took place between both sides across those meetings was almost identical from both the UKNFS team and their distinguished hosts. 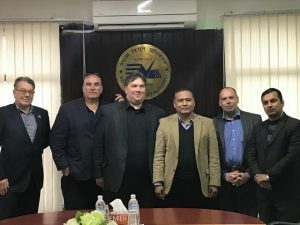 This, allied to specific practical highly positive outcome decisions on Nepal – UK business and industry sector partnering wealth creation and related maximum social benefit actions, made the programme of meetings exceptionally beneficial. The conclusions reached were on significant long-term national and international socio-economic benefits to both peoples and nations being clearly, and credibly, indicated. 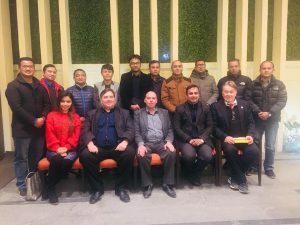 To enable these purposes to be realised the development of a UKNFS in Nepal chapter had been realised as essential, and Ganesh Panday ji appointed as UKNFS in Nepal Coordinator in 2017, later becoming a UKNFS Board Member. To enable maximum effectiveness, sustainability and the necessary independence required to be realised, the UKNFS has been actively developing private sector – communities wealth, trade and employment generation to cover its administrative costs, and have its own capacity to fund its own projects, or support those of key partners. 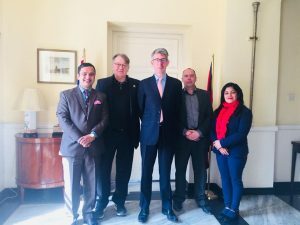 UKNFS CEO Alan Mercel-Sanca and UKNFS in Nepal Coordinator Ganesh Panday, along with Mrs Panday, and Stephen King, had a helpful catch up with HMA Richard Morris at the British Embassy, on the morning after the programme. The kindness of the welcome given by His Excellency was most appreciated by all, and the UKNFS provided news that the UK Nepali community organisations recent Parliament fact-finding educational visit and initiative report would be released soon, being provided to the Speakers of the two Houses of Parliament in Westminster, the Speaker of the Nepal Parliament, the two ambassadors, the President of the Hansard Society, and appropriate others with relevant remits for the mutual learning in this crucial area of importance to developing further bonds of friendship (and of trade, employment generation, and business). 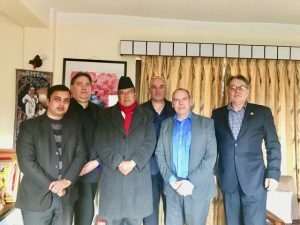 Separate to the report, an invitation to a welcome reception – discussion event from the UKNFS in Nepal group to a UK Parliament delegation (lead by Mr Virendra Sharma MP, APPG for Nepal Chair) will be made in the next few days (first week of January). This particularly from the UKNFS side on the linkage through to and from the UK Nepali community [especially its lead community organisations: NRNA, Tamu Dhee, Sahara UK, etc.] 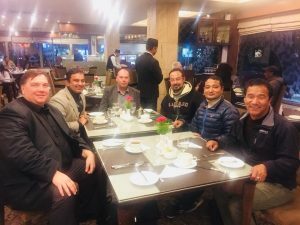 to the development of business, trade, wealth creation in Nepal for the people and all sections of society of Nepal, and reciprocally stimulating the British economy!